My friend, Carol Joy Lutz, recently delivered a wonderful sermon, “Wisdom from a Teenager: Lessons from Mary.” She reveres Mary for her faith and courage while avoiding sentimentalizing Mary to the point that she no longer resembles the thoughtful young woman we meet in the Bible. 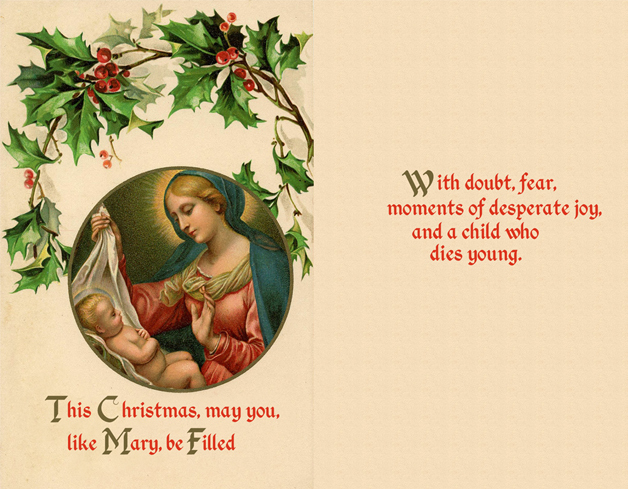 In the sermon Carol suggests what Christmas cards could look like if they truly honored the challenges Mary faced because God blessed her with being the mother of Jesus. I loved Carol’s more honest and raw Christmas greetings that respect the story of a young, pregnant, unwed virgin, whose son will be betrayed and unjustly executed. I decided to make mock-ups of these cards. These cards might shock people. I do not intend to make light of or diminish the difficulties and tragedies Mary and other parents who share her experiences have endured. 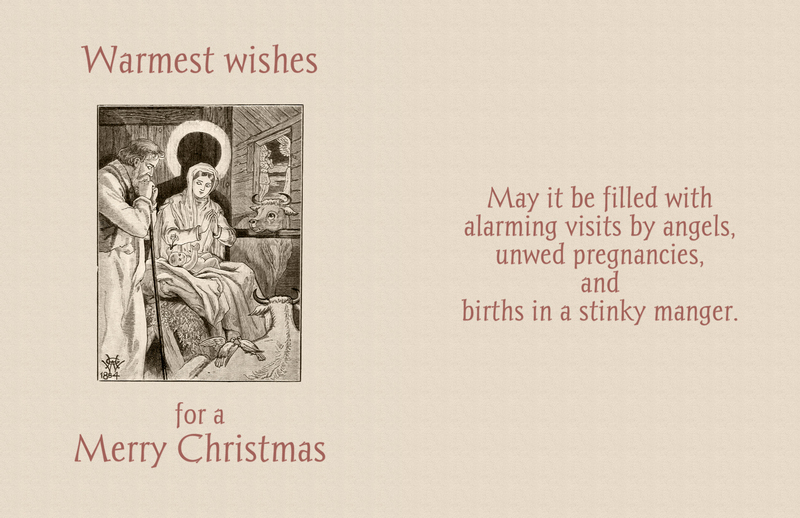 My hope is that the surprising words of these cards will prompt reflection on the costs of Mary’s discipleship. I wanted to play up the incongruities between the staid imagery of Jesus’ mother and Carol’s sobering, earthy descriptions of Mary’s experience. 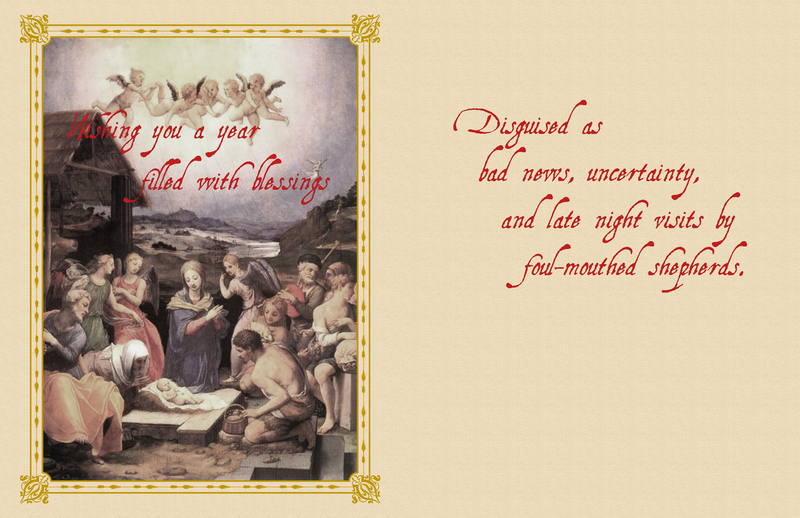 Mary was truly blessed, but let us remember the Bible defines blessing differently than we do. We often confuse being blessed with having an easy life, which is hardly ever the case for the people in the Bible who receive God’s blessing, especially Mary. Can we be like Mary? Taking time and care to unclench our jaw, to uncross our arms, to be open to what gifts God wants to give us, even if they may be disguised as suffering? Can we say a prayer of gratitude in the midst of the struggle, knowing that God can redeem the worst pile of mess in our lives? Is there something that God wants to birth in you that may have a very long gestation, that may even have a long, painful delivery, but that could bring light to this broken world?